Abu Dhabi Racing and Peugeot Middle East official driver Sheikh Khalid bin Faisal Al Qassimi, behind the wheel of a private3008 DKR Maxi, with co-driver Xavier Panseri, continued to stay inside the top 10 on completion of SS07. Refreshed after a well-deserved rest day at 3,600 meters in the Bolivian capital of La Paz, the competitors tackled the longest special since the start of the rally. The rain had made the fast earth and sand tracks on the 425km course even trickier. 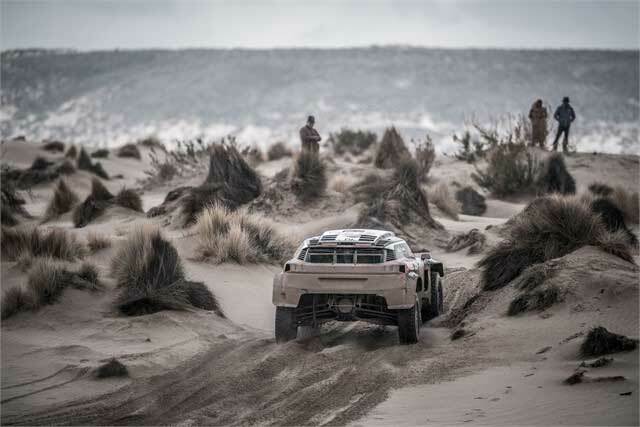 Sheikh Khalid lost some time at the first waypoint at the 10km point after his car got stuck in the river which was steadily rising due to the incessant rain, but having extricated himself the Abu Dhabi Racing driver stepped on the pedal and made steady progress. And despite facing several problems on the stage, the Abu Dhabi Racing driver did well to stay inside the top 10 by classifying overall in 8th place at the end of the day. "At waypoint one, about 10km into the stage, there was a river and the water level kept rising, Al Qassimi reported. "I saw a helicopter above me. My car was in deep waters and the strong currents were pulling my car away. We could not move the car and were stuck in the river for about 15 minutes. The water levels had reached up to my doors, this was coupled with poor visibility." "At the other end of the swelling river was a farmer in his tractor. He reversed his vehicle to a point from which he could throw a rope for us and pull us out of the river. From there on I resorted to a balanced pace as it was a bit difficult to navigate, though not much difficult. I tried to avoid the scores of puddles on the stage. It was quite difficult but we adopted a balanced pace after that. That is the nature of racing here, but we are still in the game," he finalized his adventure of the day.